Kauaeranga Valley Road, the route into the Coromandel Pinnacles, in the North Island of New Zealand. 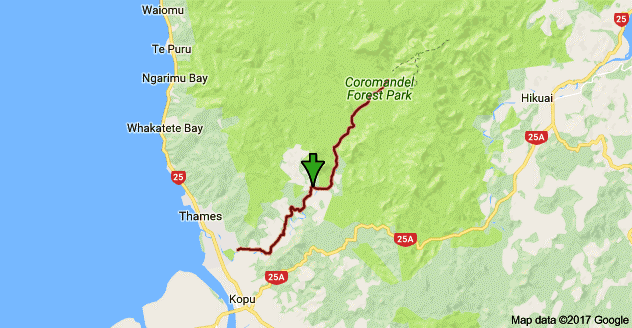 The green arrow must be where I was on Kauaeranga Valley Road at the time I downloaded this map, I think. Last weekend I went to the Coromandel State Forest Park. The park is now mostly closed with the heavy rainfall received in March has meant most of the walking tracks are currently closed, which was disappointing. The area to my knowledge had received an entire month’s worth of rain in a single day that got me worried and thinking about the very real impacts of global warming on New Zealand. Figures claim rainfall will rise in the area of Kauaeranga Valley by a massive 5% by 2040. 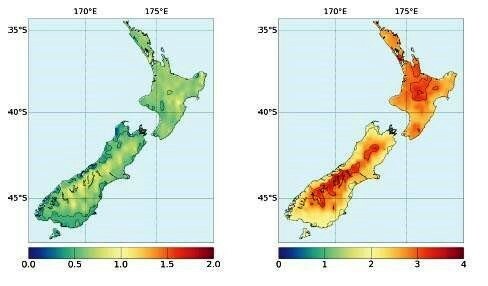 The New Zealand Ministry for the Environment (MFE) has put out some interesting predictions in relation to temperature rise and rainfall, so if it is something that interests you then definitely take a look. Average temperatures now and predictions for 2090. Crown copyright reserved. The Pinnacles walking track (which is a fabulous walk by the way and I talk about my trip in A Maverick New Zealand Way), is closed due to washout. The rain during the week of 8th of March was really bad and there were many slips in the area. I went to the DOC office in the Kauaeranga Valley and met Debbie who told me that it was closed because of flooding and slips. The DOC rangers had been out and couldn’t find the track, it is pretty bad and is going to take a fair amount of time and work to get it up and running again. Sadly for us outdoor lovers! So the Christmas dam was washed out, the popular Billy Goat Track is washed out too. The Coromandel area is really popular with people from Auckland who come there specifically to go trekking. 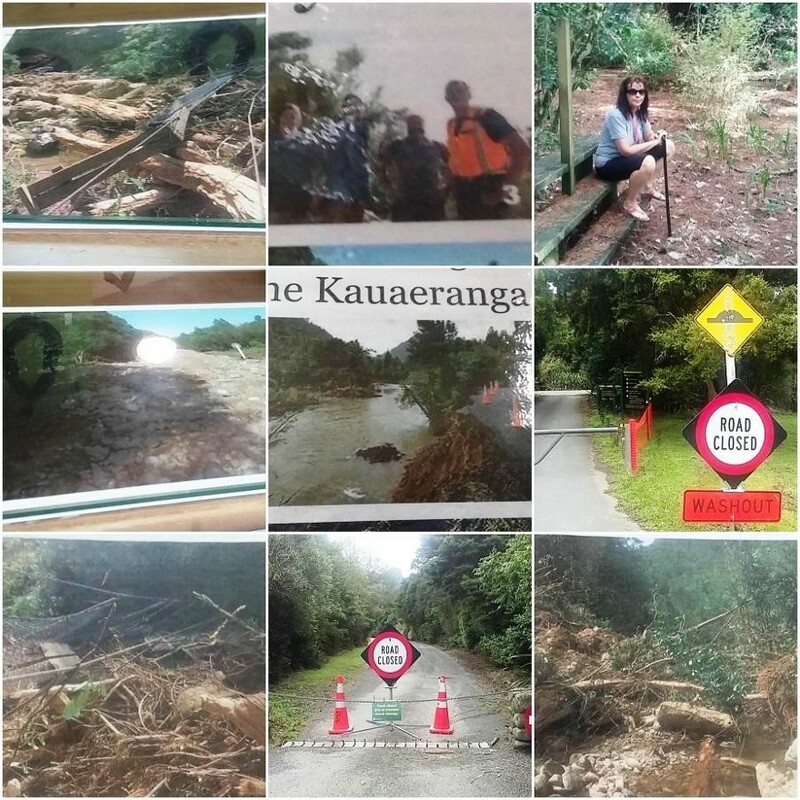 Images of flood damage and disruption, some firsthand and some of photographs of recent damage on the wall at the DOC office on Kauaeranga Valley Road, beyond which the road was closed. I have spent a lot of time in the Kahurangi National Park in the Nelson/Tasman region, most recently when I was volunteering for the Department of Conservation (DOC) and then broke my shoulder. In this particular area the predicted effect of global warming as soon as 2040, will see temperatures rise to by 3 degrees and rainfall increase by 2 percent. One effect that has become recently very obvious is flooding. There has as recent as yesterday (5th April 2017) been severe flooding across New Zealand. The town of Edgecumbe near Whakatane in the Bay of Plenty has declared a state of emergency. According to Radio New Zealand, severely affected areas include Wanganui, Wellington and sadly after severe earthquake damage, Kaikoura. In the South Island region of Canterbury they are expected to get 100mm’s of rain in 10 hours, with the annual average only sitting around 500mm’s a year. A serious increase and something to think about if not be concerned for. So anyway my recuperation is going okay, I’ve had some up and down moments. Having a broken shoulder is quite a pain I can tell you. Rather than write about it I did a little talk about it, so here you go! Enjoy!